In light of the above numbers, let’s do the math. In 2011, there were 16,959,035 Canadians that had a job. In 2016, 47.7% of the labour force were women. I know we’re mixing years, but for the sake of spitballing some numbers, that puts the number of women in the labour force at roughly 7,970,746 million women. 3,985,373 women have experienced sexual harassment as defined by Canada’s labor code. Those are staggering numbers. Staggering. What is equally staggering for me is the number of men that are then, by necessity, behind those numbers. How many men abuse their power and position to harass women sexually? It takes a lot of men to have that many women say they have been harassed. I can’t know how many, but these numbers say it isn’t a dozen or two sleazy bosses in a board room of Canada. It is safe to say that hundreds of thousands of men are responsible for the almost 4 million women to have been sexually harassed at work. It’s just not gonna work to fire them all, put them in jail, or ruin their careers. There are many, many men who are behaving badly at work. To do little or nothing (as has largely been the pattern) is obviously not working. We have to figure out what to do with all these men behaving badly. I don’t pretend to have all the answers, but I am going to throw out a few suggestions for the sake of conversation. Agree with me, disagree with me, add some ideas, change them, or anything else. Just let’s start talking about how to deal with the many men in Canada that are violating women at work, please? 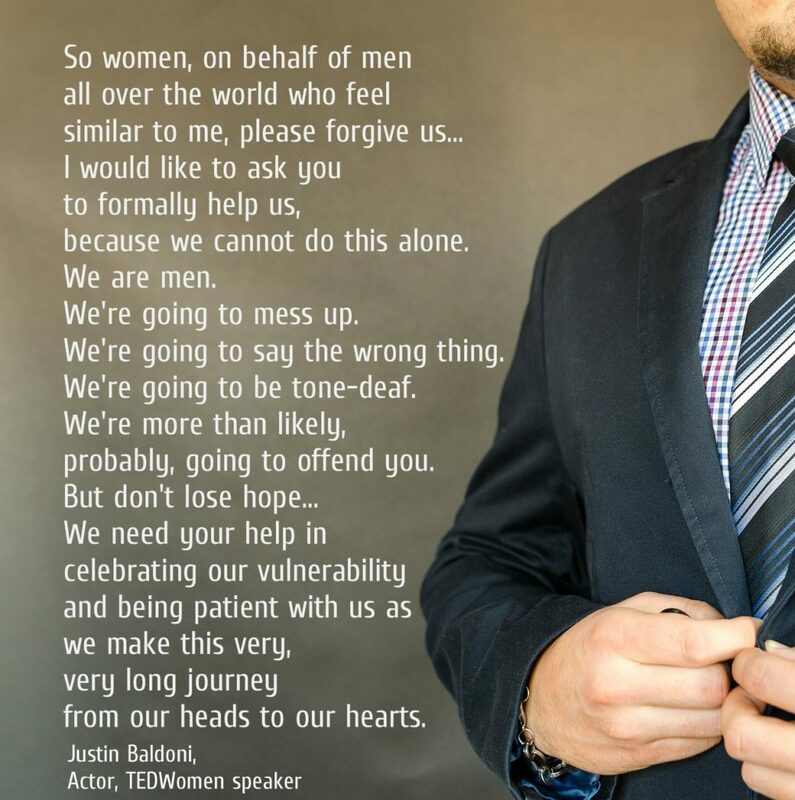 Men have been given implicit permission to behave badly around women. As a culture, it is quite frowned upon for men to objectify women. Officially. But our system allows men to get away with it. It would seem that the higher up in an organization a person is, the more indispensable others perceive him to be, the more others will implicitly allow for inappropriate behaviour. Fact is, if a person at the top of the heirarchical food chain faces consequences appropriate to his actions, the organization can suffer, even to the point of people (men and women) losing their jobs. The reputation of the business/organization/church can suffer. The consequences of not tolerating abuse against women can be very high for the organization, it’s employees/members, and the larger community. The trickle down effect of dealing justly with men in power is that many good people will be adversely affected in real, tangible ways. The reality is that sexual harassment has had an enormously high cost too–in dollars, certainly, but also in mental health. We can’t afford for it to continue. It costs to deal with it…it costs even more to not deal with it. We need to be willing to have our organizations pay that price as part of letting men know that behaving badly is not okay. When men know they aren’t untouchable, they may make different choices. Let’s hope so. Let’s recognize that we all play a part in the systems that have given men the idea that they can get away with it. That has to stop. Now. Men that have committed crimes need to be reported. investigated, and prosecuted. Men that flagrantly committed crimes need to go to jail. If a behaviour in a back alley or a bar is a crime and someone is charged and sentenced, then that same behavior is not okay to get away with a crime because it was against a junior female employee at work. Ever. Violation is wrong. All violation is not okay. None of it. Let’s deal with it all. But let’s use our judgement. 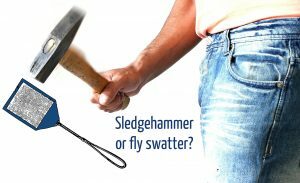 No point in using a sledgehammer to kill the fly. In fact, it’s actually not bright…collateral damage will be huge. Fly swatters were never intended to knock down a wall either. Swat that wall all day long–and that wall will take a 1000 years to fall. Violation against women in the workplace is on a spectrum. I’d like the whole spectrum of violation to be gone, but given that it exists, let’s deal with it in a measured way that allows room for learning, understanding and grace. Let’s use the level of approach that matches the situation. Sometimes sensitivity training will be enough. When the harassment is off color jokes, or a hand on the shoulder while overlooking a junior staff at the computer…sometimes education is really what is required. How are men supposed to know what’s not OK if, up until now, they have never been told? Sometime, even thoughtful men who think they are doing well have behaviours which are offensive to women. Men live in a world where talking over a women doesn’t register on their radar. They don’t realize how they have subtle behaviors that exclude women, or that feel uncomfortable. Men have grown up in the world where patriarchy is in the air they breath. Many times sensitivity training won’t be sufficient. Experts who know the situation need to discern this. Ever remember your mother yelling at you when you were a kid, saying, “DON’T YELL”? There is irony in trying to get rid of a behaviour in a style that actually repeats it. objectified women and treated them as body parts, or objects to be used for their pleasure, it doesn’t have integrity to call them monsters. To dehumanize men for dehumanizing women? It doesn’t ring true. been rude and dismissive, it wouldn’t seem consistent to relate to them in the same way. been disrespectful, it simply doesn’t seem valid to be disrespectful when processing the sexual harassment. The thing of it all is this: Men who engage in sexual harassing are brothers, fathers, uncles and mentors. As a culture, we want them to be challenged to shift from being part of the problem to become part of the solution. If we shame them, and tell them they are monsters/sexual harassers, we’re all hooped. When we tell men this is who they are–a sexual harrasser–rather than this is what they have done–engaged in sexual harassment–we sentence them (and us) to them being stuck in it, helpless to change. It’s not semantics…it’s what creates possibility for better behavior. Men need to be called to their values, to be reminded of who they want to be, to work through why they make such catastrophic choices. I imagine a world where men who do things that are intrusive towards women are called to do the personal work to change their behavior. I long for these men to change the way they raise their sons, coach their teams, visit with other men during the game…we need to create space for these men to change. 5. People are important. All people are important and need to be valued. As we relate to the offenders of sexual harassment, it needs to be done in light of the women who have been victimized. Carefully and thoughtfully. When the harassment occurred, there was little voice, little or no ability to say, “NO”. Now as we are dealing with those who have offended, we need to include the voice of those who had none before. Empowering women who were victimized during the process of investigation and outcomes has the potential to be powerfully redemptive. Remember when we didn’t think seat belts weren’t important? I remember my dad getting bloody knuckles trying to dig out the seat belts from behind the seats when I was a kid. I came home from school saying that the teacher said to use seat belts. They were tucked so far between the bottom and back of the seat, my dad gave up. We had never used them. Now I wouldn’t think to not use them. Same thing with drunk driving…it used to be frowned upon, but was actually a common practice, where folks looked the other way. The young adults I know are very deliberate about having a designated driver, or taking a cab home. The culture shifted to make real change possible. Let’s parent/coach/teach/lead our boys to grow up into men who respect the inherent dignity of a woman. Sexual harassment at the workplace will stop when there is a cultural will to end it. It will require a movement at schools, during workplace orientation, with clear guidelines and consequences in place. Where men who behave badly are charged, lose their jobs, etc. when it first occurs. We need to do all the things we did to make seatbelt usage go way up…the same comprehensive approach is needed so that there is wide support to hold men accountable for their behaviour. 7. Change can be real. Suspicion is normal. Let me ask you: Is there anything you have done in your past that you aren’t proud of, and don’t do anymore? Is there a time in your past, even a specific situation, when you treated a person that you now remember in a way that leaves you feeling embarrassed and guilty/ashamed? Things you don’t want your friends and colleagues to know how you insulted or humiliated another, because if they knew, it would skew their perception of you? 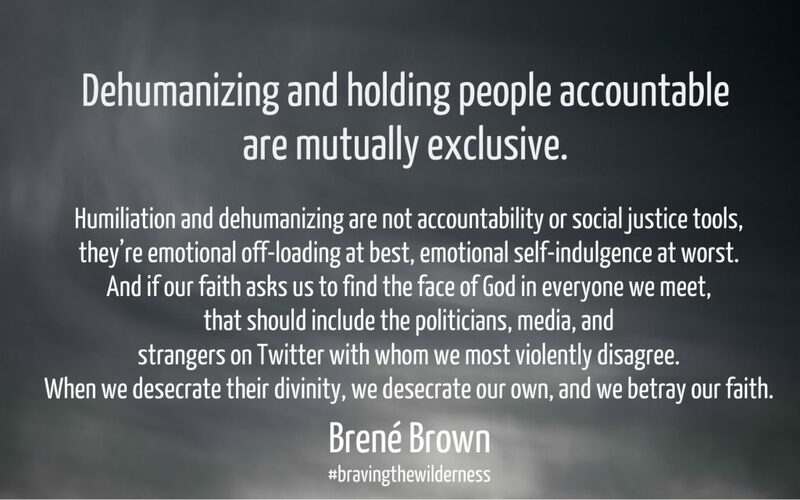 Are there past behaviors that you don’t talk about because you know that is not who you are, and you have long ago decided that you don’t do that anymore? If you’re like most, there are things in your past that you regret, and don’t broadcast out loud because you were young and foolish, and it doesn’t represent who you truly are. Judging you now on the worst things you did 20 years ago just doesn’t seem fair, does it? Men who have sexually harassed women in the past and have gone on to develop a track record of many years of respectful behaviour need to be understood in light of the totality of their lives. Doesn’t it make sense to weigh their more recent behaviour more heavily as we value growth and changed positive behaviour? It’s normal to wonder if it is true change, or a public front to get out of trouble. For those women who were hurt years ago, it can be difficult to believe that a man has chosen to change. It’s not cool when men say the right things when there is a crowd and then continue to demean and dehumanize women in private. When a man comes forward claiming he is changed, isn’t it natural for a woman who has been victimized in the past to wonder if he is sincere? We have to allow space for men to have truly changed. We have to allow for the understandable suspicion of women. Holding space for opposites is hard. But worth it. In sum…this isn’t going to be easy. Important things are rarely easy. Read the numbers again at the top of this blog. We can’t get away from dealing with it. **I recognize that this blog deals with the sexual harassment of women perpetrated by men, which can feel exclusive and incomplete, especially by men and women who have experienced sexual harassment by women. We see you and all sexual harassment hurts, violates, and intimidates. Know that your experience matters too.